a. Spontaneous Demand: Applications written by professors on the faculty of universities in São Paulo State or researchers at research institutions in the state who identify on their own account a partner company interested in co-funding the project and using the results. b. Calls for Proposals: Projects selected in public Calls for Proposals (CFPs) issued jointly by FAPESP and one or more partner companies under the aegis of cooperation agreements between the parties. FAPESP’s agreements with companies are listed at http://fapesp.br/agreements/. The rules for applying to PITE are available at www.fapesp.br/en/11829. 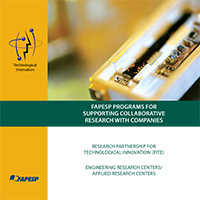 One of the current challenges to the progress of knowledge is the complexity of the problems addressed, often requiring longer periods than the two to five years of funding traditionally offered by FAPESP in the form of Regular Research Grants and Thematic Projects, or the typical projects supported by FAPESP’s Research Partnership for Technological Innovation Program (PITE). Long-term funding and in many cases interdisciplinary approaches permit successful treatment of complex problems. For this reason FAPESP created its Special Program for Research, Innovation & Dissemination Centers (RIDCs), which supports long-term research projects. While a bold approach is called for to surmount these challenges, at the same time identifying the problems often requires partnering with companies or government entities that are directly linked to society. FAPESP’s Engineering Research Centers (ERC)/Applied Research Centers (ARC) Program uses the successful model of the Special Program for RIDCs and associates it with PITE, in which a partner firm co-funds the research and is strongly motivated to participate in defining the focal themes to be investigated, to play an active role in research projects, and to use the results obtained by the ERC or ARC concerned. Projects last up to ten years, with reviews in years 3, 5 and 7. Projects are selected in public Calls for Proposals (CFPs) issued jointly by FAPESP and one or more partner companies. In exceptional and very well justified cases, FAPESP may accept consultations addressed to dc@fapesp.br by universities or research institutions that have a prospective partner company interested in establishing an ERC or ARC. The ERCs and ARCs agreed to date are listed at www.fapesp.br/cpe/home. Download the folder of the program that foster research driven by business challenges in S&T in universities and research institutions.